Forward thinking First Nation groups and eco minded groups had a vision of delivering live images of the secret lives of wild creatures, such as the majestic Grizzly Bear, living in their natural habitat. 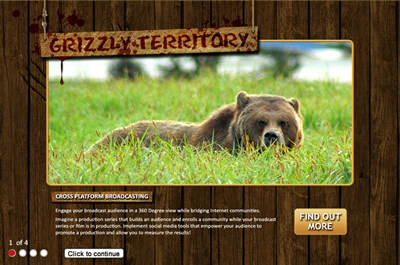 Not only were the Grizzly Bears wild, but their location presented WebStager with enormous challenges. Located in B.C. 's coastal mountain range and so remote that there wasn't even cellular service, we faced some significant technical challenges. The goal was to deliver live images by way of Hi Res IP cameras. We designed special self- powered stand-alone units capable of transmitting live images via satellite to a global Internet community. We also used our own social networking engine to create a custom member platform complete with live chat, social collaboration tools and, most importantly, live Hi Res images of Grizzlies and other wild creatures. Combined with video footage, stunning photography and up to the minute video blogs, this project was to become the basis of a proposed TV Series.